Ladies undergoing Chemotherapy could consider this option as eyebrows & eyelashes can be effected by their treatment, this would have to be carried out before treatment starts. Great for Alopecia sufferers too. You dont have to look “made up”. It is more about definition. Before we begin you will be offered a free initial, no obligation consultation where we can recommend the best cosmetic solution for you. Our treatments are available in clinics throughout Southern England, the Isle of Wight and south Wales. Prices include the initial treatment and a re-touch procedure 6 weeks – 3 months after. Having trained with Nouveau Contour, one of the UK’s leading trainers, we can advise you on colours and shapes that suit you, so you will love your permanent make up for years to come. Please ask me for a voucher to redeem discount. Non Irritant - giving comfort for sensitive skin types. A sensitivity test will be carried out before treatment commences. I have had my eyebrows enhanced, so you can see the results when you attend your appointment. I am so pleased with how they look both when wearing make up or without make up. Permanent make-up (also known as micro-pigmentation and semi-permanent make-up) is a revolutionary beauty treatment where tiny depositis of pigment are infused into the skin to give the look of natural, perfectly applied make up lasting for up to 7 years. After this time a top-up will be required. Those with sparse or no eyebrows or lashes. People who want to look their best at all times. Professionals or mothers who have no time for make up. Sporty people, swimmers and those who sail. Hay fever sufferers or make up allergies. Those wanting a non surgical anti ageing solution. Those less skilled with make up or with poor eyesight. Patients with post operative scarring. 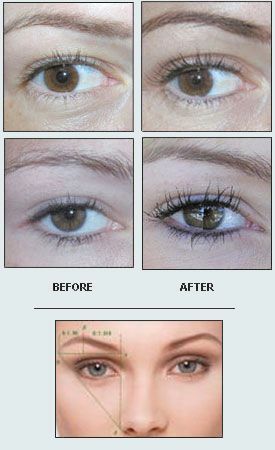 Time Saving - You will not need to apply, repair of remove your make up. Smudge Proof - Look perfect on the beach, swimming, playing sports, or after crying. Perfect Application - for those less skilled or with poor eyesight. Anti Ageing - a non surgical solution giving lift to brows and fuller lips while avoiding the drag and pull of applying and removing make up. No messy glue, light , comfortable & natural looking eyelashes. Easy to apply, spare adhesive strip.